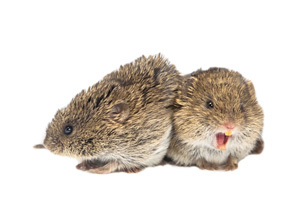 Appearance - Voles have a brownish black body fur, and have short legs and tails. They are sometimes called meadow mice, as they are rodents and similar in appearance. They are bigger them mice though, ranging in sizes from 5 to 8 inches. long. Behavior - Voles become a nuisance because they invade landscaped lawns or gardens, feeding on plants. They are typically found in grassy or weed filled areas where there is plenty of cover. They construct burrows underground to hide from predators. Voles will eat a variety of plants, so they can easily become a pest in agricultural areas or even residential areas with lots of landscaping and gardens for them to eat. Voles can destroy your hard worked vegetable or flower garden, causing damage enough to kill plants if left unchecked. They can also be a nuisance with their tunnels and burrows under turf grass, leaving holes in your yard.